Quilty Habit: Selvage Along: Link Up Your Selvages! For the next week, as a start to the Selvage Along, you can link up how you store selvages and/or a project (with selvages, of course) that you would like to work on through September. This is a joint linky party shared between Renee and myself, so you can link up on either blog! I store all of my selvages from the last five years in this huge basket. I promise there's a basket under there. :D Clearly, I need to find some new storage or actually start making something! There are some gems in there! 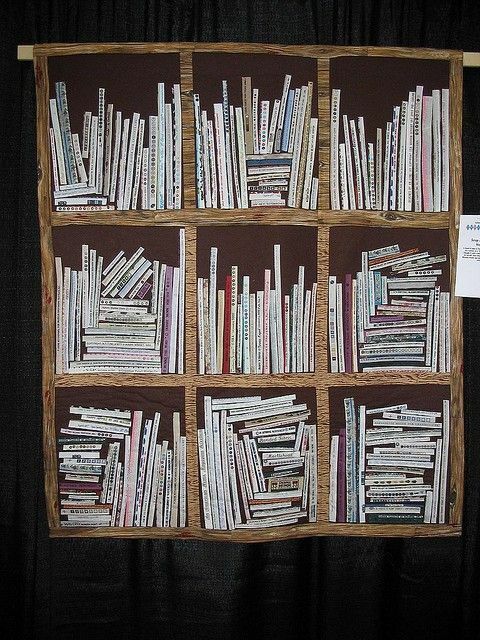 I've been toying with making a selvage bookcase wallhanging like this one (artist unknown) but I can't decide on a background (I just can't get with the brown). 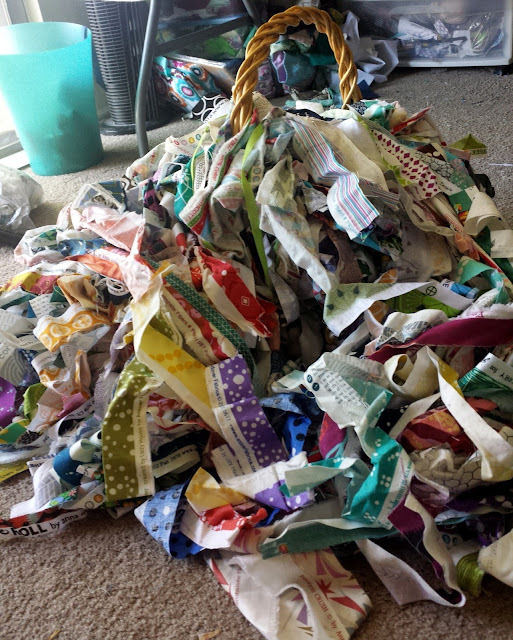 I'm thinking rainbow selvages... maybe on white, like my own bookcase? What do you think? Write up a blog post or link up a blog post. It's always fun to share! July 24 - Selvage storage/collection linkup <<<You are here! Fantastic quilt along, I love working with selvedges. Linking up one of my tutorials. I truly love the book case and like the brown but will be waiting to see the rainbow version before I start mine. So happy to have found you today. I love selvages, and I'm going to make a blogpost soon.